Gold drops more than $15 in less than 24 hours… but does it matter? McDonald’s corporate cracks down on a stoner billboard… startup statistics questioned… a reader challenges James Altucher’s homeownership dis… and more! “Whazzup with Au?” writes one of our regulars — invoking the symbol for gold on the periodic table. At the time he wrote in on Tuesday morning, gold was touching year-to-date highs around $1,293 — a $75 improvement in a month. “So the rate increase next week is baked in, right? So what’s going on with the price in gold (and, in a similar vein, Bitcoin)? “Is it the possible wars with Iran or North Korea? That economic data are weak enough where the market is looking past the June increase and saying the next one won’t happen? As it happens, gold has tumbled more than $15 in less than 24 hours. The bid is now $1,274. The selling began during electronic trade yesterday afternoon, the moments after trading on the Comex wrapped up for the day. Then the Midas metal took an even bigger spill around 9:30 EDT this morning. Conspiracy theorists immediately smelled a rat, suggesting it was no coincidence today’s dump came minutes before former FBI chief James Comey began his testimony on Capitol Hill — an event the Establishment deems so huge that the dinosaur broadcast networks are pre-empting The View and The Price Is Right to carry it. Whenever gold reclaims the $1,300 level, it will have completed a round trip that began Election Day. “This dip and recovery reflects several factors,” Jim tells us. 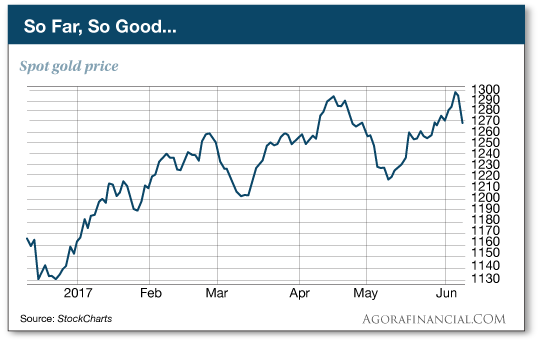 “The dip from Nov. 8 to Dec. 15 was based on Trump euphoria. With tax cuts, health care reform, infrastructure spending and reduced regulation on the way, analysts expected solid real growth. Investors sold gold and bought stocks, and the rest is history. Which brings us back to the Comey testimony today. It does matter for the gold price, at least in a wider context, says Jim. And let’s not forget the Fed. Next Wednesday it will bump up the fed funds rate another quarter percentage point. “They are continuing on their kamikaze mission of raising interest rates into weakness,” Jim goes on. “June 14 will be D-Day. On that day, the Fed will both raise rates and outline a plan to reduce the base money supply under the banner of ‘balance sheet normalization,’ also known as quantitative tightening, or QT. “You can think of QT as the evil twin of QE (quantitative easing). QE is a substitute for rate cuts, and QT is a substitute for rate hikes. The Fed is putting the entire easy money episode of 2007–2015 in reverse with a double-barreled blast of tightening through rates and the money supply channel. And the economic numbers have been anything but strong. There’s been a dearth of data this week. But there was a barrage of bad news last week, Jim reminds us. “Job growth slowed, labor force participation dropped, inflation dropped, auto sales declined and real wages continued to flat-line. Gold sees what’s coming next, which is either a recession or something close to it by the late summer. [Ed. note: Jim is so confident about gold’s prospects this summer that he’s reviving his “Double Gold” offer. For access to his team’s penny stock picks — and a double version of his free-gold offer — look here. As the day grinds on, the infamous “triple threat” to the markets touted by the mainstream on Monday is fizzling. Aside from Comey’s testimony, there’s also a meeting by the European Central Bank — which on the one hand indicated it’s done with interest rate cuts… but on the other hand it said it would extend its quantitative easing/money printing if need be. That said, the parliamentary elections in Britain are ongoing as we write, so there might yet be some thrills ’n’ chills later tonight and tomorrow. But in the meantime, the major U.S. stock indexes are slightly in the green. Gold has recovered a couple of bucks to $1,276. Treasury rates are inching back up. Crude is steady, a shade below $46. “The crash is beginning,” says our Rick Pearson — who’s been laser-focused all year on the gathering disaster of subprime auto loans. 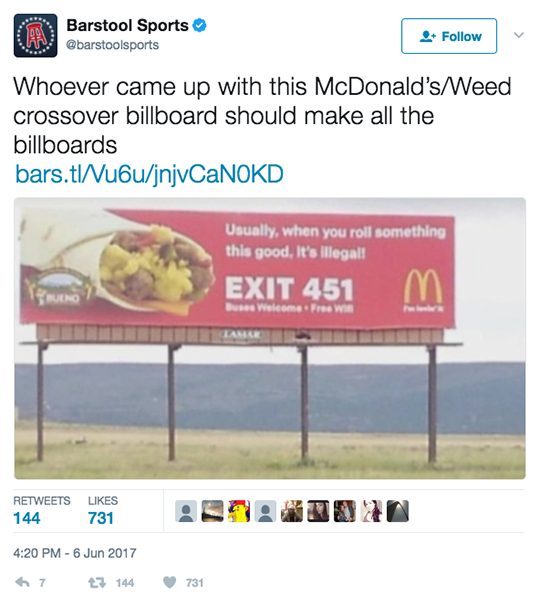 This billboard can be found outside Raton, New Mexico — about 12 miles from the state line with Colorado, the pioneer in legalized recreational pot. And yes, this particular McDonald’s is owned by a franchisee, not the company itself. Once a photo of the billboard went viral a few days ago, word quickly got back to MCD headquarters in Oak Brook, Illinois. The suits were not amused. The billboard “does not meet our standards and is being taken down,” said a statement. On the subject of the waning number of startups, a reader writes: “If these numbers are coming from Department of Commerce or any other federal or state government agency, they are likely bogus. “More and more people that I know (even family) are starting up businesses without the ‘benefit’ of a governmental blessing — going the underground economy route to avoid paperwork and taxes (and more paperwork) and costs of all sorts. They are going the cash route when possible, and if having to use/take plastic or checks, doing it through personal accounts or PayPal or the like (don’t know anyone personally using Bitcoin, or at least admitting to it). Or just doing barter. The 5: The Economic Innovation Group did rely on Census data for much of its research. We understand your point. On the other hand, what else is there to go on? Nor do we doubt there are substantial numbers of people conducting commerce and employing other people under the table. That’s a natural consequence of the paperwork and taxes and more paperwork. The question is can that scale up? A typical new business creates six new positions in its first year. But we doubt that rule of thumb applies to a startup in the underground economy. On James Altucher’s contempt for homeownership, a reader begs to differ: “Even in California, where housing costs are more than triple the national average, owning beats renting if you plan to stay longer than five or 10 years. “That’s because inflation raises home values but not fixed mortgage rates and property taxes, while rents keep rising inexorably irrespective of inflation. Already the Census Bureau says the median length of homeownership is not even six years. And it’s James’ opinion that in the economy of the future, few of us will live in one place that long. “Why do people move?” he says. “Because jobs are no longer as stable as they once were. And they are no longer in one or two cities but all over the country or world. “So the original reasons for owning a house (a guaranteed easy commute into an urban area where the jobs are) are no longer valid, as demonstrated by the increasingly short life span of house ownership. P.S. Did you play it? Jim Rickards’ prescient call last week on a falling oil price has turned into a 35% gain in only 10 days for readers of Rickards’ Intelligence Triggers. If you want access to fast-moving trades like these, you’ll want to give this a look right now.